Ahoy, matey! 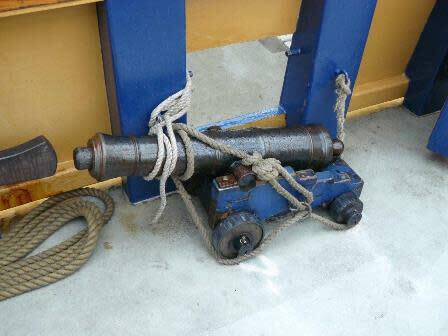 When you tour the tall ship Hawaiian Chieftain, you suddenly want to talk like a pirate. 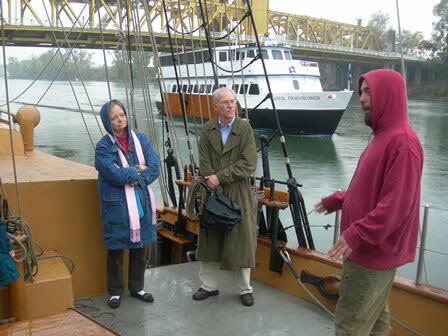 She was berthed on the river in Old Sacramento from October 22 through December 8 for her annual visit to our city. 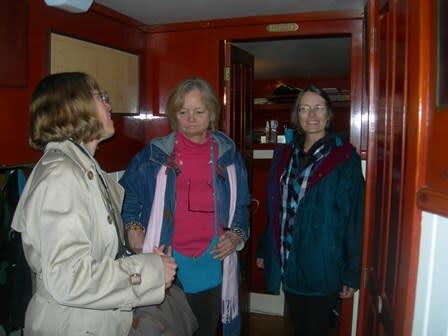 The day we went on board for our latest adventure was cold and rainy. So that added a bit of mystery to the experience. 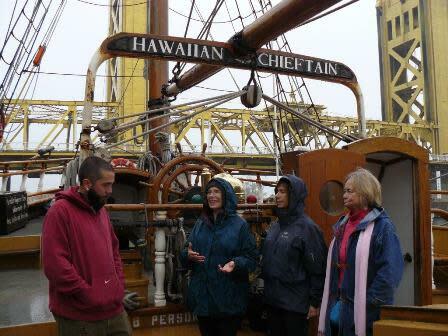 This sailing vessel Hawaiian Chieftain is called a tall ship in nautical terms. She was commissioned and built to look like a 19th century trading vessel. But the original owner, Laurence H. Dorcy, who resided in Hawaii and paid for the ship from railroad money, added modern trappings like a triple keel and a shallow 5.5 foot-draft hull. He hoped the steel boat would be an Island hopper to transport cargo during the 1970s fuel crisis. 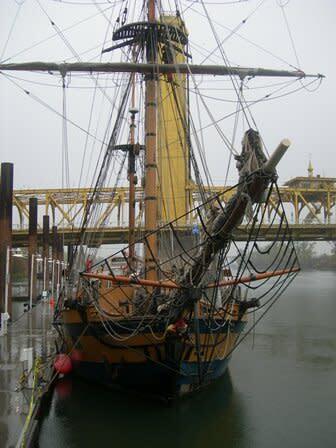 This ship has had a few owners and a colorful life before she was acquired by the Grays Harbor Historical Seaport Authority in Aberdeen, Wash. Today, the Hawaiian Chieftain is a teaching vessel. The Chieftain sails up and down the Pacific coast from San Diego, Calif., to Aberdeen, putting into about 55 different ports in between. 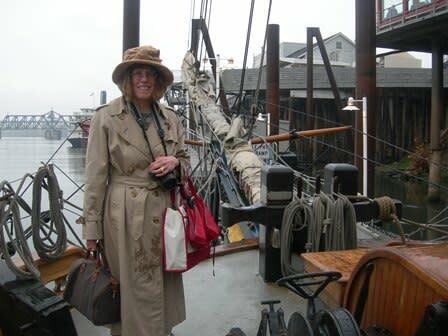 Every few years, she will do a trip along the Columbia River passing through the dams (locks). 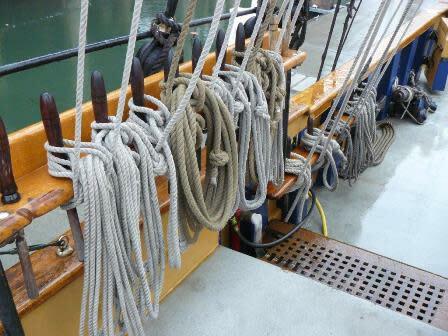 The Chieftain and her crew offer several different ways of learning about the seafaring life. There are one-hour dockside programs that allow students to learn about the life of a sailor, navigation and the history of trade on sailing ships. In the three-hour Voyages of Discovery sailing program, students work like actual sailors. This teaches teamwork, as participants must pull together to set and trim the sails. Students will realize how important math, science, music, history, language arts and teamwork all combine and integrate into the experience. Also offered are two-hour pleasure sails and evening sunset sails. But the ultimate trip is the Two Week Before the Mast Sail, where you get the behind-the-scenes experience of being part of a sailing crew. Out of the 15 crew, there are only seven paid positions. 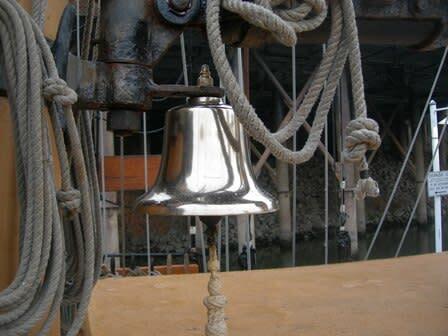 The remainder of the crew is volunteers and those signed up for the Sail Training. The day we toured the Chieftain we stayed in port and learned about the ship from First Mate Jason. The crews are a blend of mariners, educators and sailors in training. Jason clearly likes his job and enjoyed showing us his home. Jason said the thing that surprises tourists the most is that they have as many women as men sign on for the Passage Tour. While we haven&apos;t signed on to crew, yet, we have a better appreciation of how challenging a tour would be. You can&apos;t be claustrophobic since the cabins down below are small and confining. The sleeping cabin has bunks for 15 people in one tight room. We were told that everybody snores. 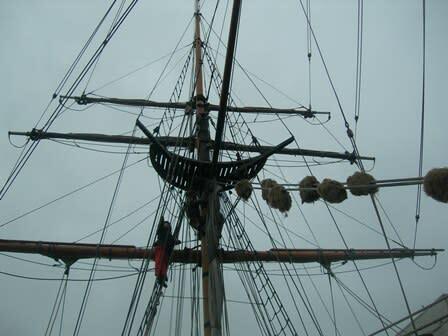 You can&apos;t be afraid of heights because you need to climb up the 75-foot-high mast to repair the sails and lines. And you certainly can&apos;t be prone to motion sickness because there is a lot of motion in a 100-foot-long ship with a shallow hull that is under sail on a stormy day. The tall ship Hawaiian Chieftain is really beautiful. It is a shame that people can&apos;t see the ship from Sacramento city streets. It is hidden behind a restaurant and under Tower Bridge. We had to follow the signs to get to the ramp to get to the ship. It was worth the effort, though. We had a fun day. So when she sails into port again, make the time to wander into Old Sacramento and visit the Hawaiian Chieftain. To get you into the mood, here is a favorite poem of Janet’s. And a grey mist on the sea&apos;s face, and a grey dawn breaking. And quiet sleep and a sweet dream when the long trip&apos;s over.